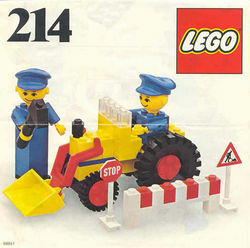 214 Road Repair is a Building Set with People set released in 1977. It contains 64 pieces. In addition, the set included two Homemaker Figures. 214 Road Repair was only released in Europe, UK, Australia and Canada. Facts about "214 Road Repair"
This page was last edited on 12 January 2016, at 18:26.